This is the 20th Anniversary Half Baked and also the Final Half Baked! Littleton Village Hall Keep the date free! "If you've half a mind to join the hash, that's all you need"
The Hursley hash was founded on the 6th May 1990 by Mudlark, who had arrived from the Isle of Wight, and More; they knew that there was a local hash in Winchester - but could they find it? 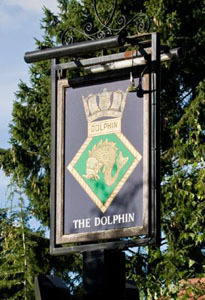 So they started one at the Dolphin pub in Hursley. We have been meeting at 11 o'clock every Sunday morning somewhere in Hampshire ever since. So our genealogy goes like this: 1938 Kuala Lumpa ➮ 1962 Singapore ➮ 1979 Wessex ➮ 1983 Haunch of Venison ➮ 1983 IoW ➮ 1990 Hursley. A map of our patch can be seen here. Twenty to thirty harriers and harriettes would be an average turn out so we have no problems squeezing into even the smallest of Hampshire pubs. We are lucky in this neck of the woods to have an abundance of hashes, you don't have to go far to find a hash on almost any day of the week (see the links) and we have close ties with many of them sharing events, celebratory runs, cups of sugar and so-on.